RPZ Backflows a Catastrophic Flood Risk? What you need to know. 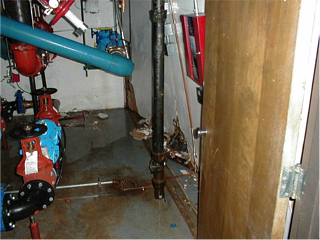 Plumbing engineers routinely design RPZ backflow devices inside the building. This puts the building and property owner at risk due to flooding. Over the last two years we’ve conducted lunch & learn sessions about backflow installation practices and trends with more than 1,200 civil and plumbing engineers. We found the risk of flooding from the relief valve of the RPZ backflow preventer is a big surprise to most. The unnecessary design risk created when the RPZ is installed inside is still not common knowledge. Likewise, the market seems unaware that a flood valve is offered by the popular backflow device manufacturing companies. The RPZ Flood Valve – why does it exist in the first place? 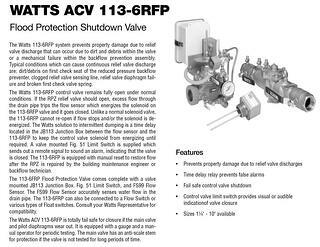 The most popular backflow device companies offer what is called a flood protection shut down valve. Here’s the spec sheet for the Watts version of this valve. Notice it references the fact that "catastrophic property damage can occur due to relief valve discharge." This, along with the relief valve flow rate charts from the same manufacturer suggest that they want the design community to be informed about the potential flood risk associated with an installation inside the building. Also, notice in the spec sheet the list of typical conditions that can cause continuous relief valve discharge. None are far fetched and any backflow tester will acknowledge these conditions are common as they test and service backflow devices. The opportunity for relief valve flooding is real. As a designer, why take this risk? Check out the video below to watch an RPZ discharging water. IF RPZ Valves don't flood, why make this device? The mere availability of the flood valve is enough evidence that RPZ backflow preventers have the potential to flood and dump more water than the drain system can carry. In fact, Watts even provides a case study on their site which states these valves are "safeguarding invaluable bio-research" at the University of Massachusetts. The building has 20 backflow preventers and needed numerous flood protection valves to protect the research contained there. The engineer for this building knew the risks. However, most don't. From the time we’ve spent with plumbing engineers, we’ve learned designers largely don’t know the fact that the purpose of the RPZ is to dump water to prevent backflow when one of the check valves fail. After each presentation, we asked participants what they thought was most interesting. A majority of respondents said they were surprised to learn about the risks of rpz flooding. Partly because of this response, we put together a simple but comprehensive post on the differences between double check and RPZ backflow prevention devices. It's our highest read post. In spite of the availability of this flood valve, our manufacturer’s reps tell us this valve is rarely sold. National sales for these flood protection shut down valves are less than a couple dozen per year so while the valve is available, it is not widely used. Again, this points to the lack of understanding of the RPZ valve. The RPZ is a mechanical device with check valves that can fail to close during operation. When that happens, it is designed to dump water as a fail-safe mechanism. This is why it provides so much more protection against contamination than a double check valve, but is also why it is risky to install them inside. Randy Holland, who recently spoke at the National ASPE conference in Phoenix as well as the GAWP Fall Conference in Dalton, likens an RPZ backflow preventer inside to a Dragon in the Basement. The more sensible approach to avoiding this risk is to specify RPZ valves outside. However, if they are already inside or this is not a viable option, the design engineer should absolutely add a flood protection shut down valve to protect the building and prevent loss. Keep in mind however that specifying the flood valve adds additional upfront cost to the project for your client and adds to the list of things your customer must maintain over time. If you are an architect or design engineer, consider the risk of installing RPZ valves inside the building. Backflow device companies provide flood protection shutdown valves and relief valve discharge rates because they know the discharge from a relief valve can cause catastrophic flooding. If a building floods and your client’s insurance company starts looking for the cause, you could be the person selected as the one responsible for the flood. Do you want to be held accountable for the damage caused by an RPZ like in the image to the right? Our work with engineers and architects over the last two years tell us that most just simply are unaware of the flood risks. Now, as now an informed designer will you explain the flood risks to your client and provide them with options? Will your owner choose to spend the extra money and add a flood protection shut down valve or prefer to simply move the RPZ outside the building to remove the flood risk?